Finally, there he is, on the other side of a bulletproof glass. The forty-one-year-old she has flown across the Atlantic to meet. A man about to die. He looks at her, sees her glancing at the armed guard, three steps behind her. The man in the cage picks up the telephone and says hello, introduces himself. “My name is Vaughn Ross”, he says. When Carina Bergfeldt meets the convicted double murderer, one week remains of his life. In seven days he will be strapped to a gurney and injected with a lethal poison. He is sentenced to die in Texas, the state that executes more prisoners than any other in the US. For ten years, nine months and ten days Vaughn Ross has been on death row, waiting to atone for the crime he was convicted of in 2002. The conversation between the Swedish journalist and the American killer is the start of a week in Texas that involves a chaplain who has heard the last confessions of 150 killers, a warden who has escorted 88 men and one women into a death chamber – none of which came out of the room alive – a woman who loves a murderer, a family that wants revenge and a cop whose sworn promise will be fulfilled only once the deadly dose flows into Vaughn Ross’ body. Carina Bergfeldt manages to portray how the consequences of the Death Penalty affects the lives of many more than just those who are touched by the extreme consequence. Despite the fact that the subject is life and death and an eye for an eye the characters are nuanced, making you care for them. It is a very heartbreaking book. Through the eyes and words of Swedish journalist Carina Bergfeldt I have met a person, not particularly good or innocent, nor particularly evil. The accomplishment of her very detailed and leisurely story-telling technique is that I – when the poison is injected into the young American’s veins – no longer am interested in the question of guilt. That may be as it is. Vaughn Ross was a person. And states do not have the right to willfully execute their citizens. Bergfeldt does good handiwork rooted in extensive research (the source references are four pages long). She lets different voices step forward to build a tight story in several layers where the complexity of the subject is never lost- She has found those who resonate, or agitate, for or against the Death Penalty, there are equally strong convictions in both groups. I like it when Bergfeldt works as a journalist, reports facts, layers with animating case studies and stands aside for the people she interviews. In Seven Days to Live we meet the victim’s family, the condemnede’s family, the Warden, the reporter who monitors every execution and the chaplain who holds the hand of the condemned. Bergfeldt as a storyteller manages to portray the personal anguish, the hate, the hope. It is often moving and macabre at the same time. This is without a doubt one of the books that has made the biggest impression on me, ever. This is an incredibly well written, strong and courageous story, that is moving and engaging. Carina Bergfeldt is a brilliant storyteller, and the journey she has made is admirable. I am impressed by her skillful technique, passion for human lives and will to let several voices be heard in a matter that often arouses powerful emotions. The book is skillfully composed, rich on facts but suspenseful like a crime novel. I recommend that everyone read it. Well written on the Death Penalty. Deftly told, with the light touch of the evening newspaper journalist and with a feeling for expositive details, we get to meet the people affected by the Death Penalty. The police, the bereaved, the mother whose daughter is murdered, the Warden, the chaplain and the journalist who has covered 374 executions. You cannot guard against it and nothing is black and white anymore after the last page. Carina Bergfeldt talks with several of the families, a Warden and brings up many interesting cases where prisoners are waiting to be executed. She writes intelligently and I have a hard time stopping myself from reading. This is a good rating since I have been having difficulties keeping my concentration on one book these past few years. However, it is not problem that concerns this well written book. One week in Texas that contains many stories and tales but it starts and ends with Vaugh Ross, the man with seven days to live. 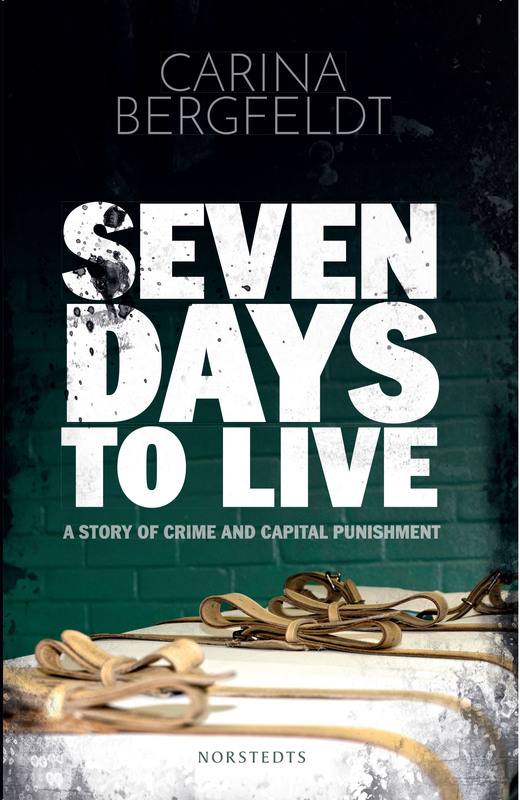 Seven Days to Live – A Book About Crime and the Capital Punishment is a suspenseful, sometimes a bit uneasy but very interesting and well written book by Carina Bergfeldt. Even though several of the concerned give voice to powerful emotions the atmosphere in the book is almost absurdly normal. This effectively underlines the anticlimax that is actually reached when death finally occurs. Yet another person is dead and all other doors are closed. For a confession, for an explanation and for atonement.